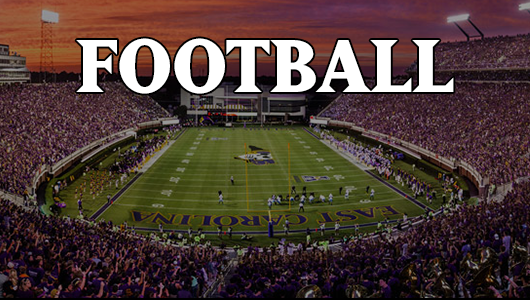 If you are anything like I am, the opening week of ECU’s football season is the longest week of the year to endure. The anticipation is palpable and even though I am on vacation, I am counting the moments to kickoff on Saturday. Fortunately for me, I will be home in time for the 7 p.m. clash with upstart Old Dominion and will be on the edge of my seat from that minute on till the season ends. So, with us entering mid-week of game week, let’s talk Depth Chart. The two deep was released for the Pirates on Monday and on it, IMO, was a couple of bold statements. And, along with those bold statements, a lot was said not only by who was on the DC, but who wasn’t. On the Depth Chart, the first thing that jumped out at me was at the wide receiver position. Yes, with the loss of Justin Jones and Jabril Solomon, we expected the DC to look a little different than expected, and Coach Ruffin McNeill signaled some of the changes in previous interviews, it was still a little startling to me to see two (2) true freshman on the 2-deep going into this game. On the one hand, it speaks volumes to the talent of both Davon Grayson and Isaiah Jones, but on the other hand, it also is somewhat worrisome to me that these two football babies are now in pivotal positions in a position group long considered our deepest and more talented. What I expected to see was some movement across the outside wide receiver position that settled with Reese Wiggins and Lance Ray as the two starting OWRs with DaQuan Barnes and Cam Worthy (the transfer) as the back-ups. I expected to see Grayson in the mix given his performance in camp and how high Lincoln Riley was on this true frosh and I knew that Jones might have a shot based on camp performance but expected that neither would be in jeopardy of losing his redshirt in Game 1 of the season. I suppose losing Solomon was the big gut punch for our offense given the relative thinness in the ranks on the outside, but seeing two true freshman on the DC chart still is quite shocking. That said, if Grayson plays like he has shown in camp, he may be a pleasant surprise. I would prefer to see at least one of the two freshman not need to see the field, but if they are our best options, than we have to put them out there. Inside, the DC is as expected, save Isaiah Jones. I expect we will see more of a three-receiver rotation early on with Justin Hardy, Danny Webster, and Bryce Williams along with some Zico Pasut in there as well. Staying with the offense, I was happy to see that Marquez Grayson’s name was nowhere to be found on the DC. It tells me two things: 1) that our running back depth is solid; 2) that Cory Hunter is a legit back rather than a spring backfield filler. With Breon Allen on the mend, I was worried that Grayson might be a candidate for the DC and was hoping he was at least a year away from competing for playing time. I expect Allen – when he is ready to go – to find his way to No. 2 on the DC and expect to see Chris Hairston start to make a push for carries as the season moves along. Up front, there were fewer surprises. I was thrilled to see names like Chaz Lowery, Stewart Hinson, Drew Gentry, Keifer Neal and Tre Robertson on the DC. Not because it was not expected, but because it WAS expected and happened. This tells me that the recruiting on the OL is as expected and that the ascension planning is on track. These are the names of the future AAC slob knockers for the Pirates. Had some of these names been missing, it would spell problems for the Pirates offensively going forward. I was a little surprised to see C.J. Struyk at No. 2 at the center, as I fully expected J.T. Boyd to surpass him, but I see this more a credit to C.J.’s drive and physicality than a slight to J.T.’s talent. We are solid at Center and it feels great…finally. And, finally…at QB…no surprises…just like we like it. Could Kurt Benkert’s name been at No. 2? Probably. Would that make sense or benefit the team at this point? No. For me, the first one that jumped out was Josh Hawkins at corner. I fully expected Detric Allen to win that position, but appreciate that Hawkins really stepped up to win that battle. Coach Rick Smith is particular about the mental make-up of his corners so there is no questioning here, only surprise that Hawkins made this happen. The second name to jump out at me was walk-on Frederick Presley at DE. Don’t know much about him, but didn’t see a walk-on on the two-deep at DE. Instead, I expected to see Jeton Beavers name there. Now I am trying to pull together any info I can find on Presley. Seeing Terrell Stanley at No. 2 on the DE rather than No. 2 at nose guard tells me that first, Crishon Rose must be a stud to knock Stanley out to the end and two, second, that John White must be greatly improved to push back a more experienced player like Stanley. A couple of other personal surprises for me: Seeing Zeek Biggers at a No. 3 really surprised me. He seems to me, to be the one linebacker who appeared to be difficult to hold back much longer. The guy was a wrecking machine on special teams and has the motor and enthusiasm that you really want to see in your inside backers. I thought he would be sitting at No. 2 behind Kyle Tudor. I expected Gabe Woullard would get the nod ahead of Montese Overton, but am going to watch that spot closely because, IMO, Overton is such a superior athlete – the most gifted in the whole corps – that I don’t see how he stays at No. 2 long, no deference to Woullard. I was surprised to see Lamar Ivey out at corner and thought that Michael Dobson was at corner now (must be behind on Pirate moves of late). I was so pulling for Dobson…love that kid’s attitude and was pulling hard for him to emerge a starter as a senior. BTW, how stacked are we at the Will position? Man, when a player like Jake Geary is No. 3, you got game at a position. wow…just wow! At field corner, I hope that Adonis Armstrong is simply that much better now, because I fully expected DaShawn Amos to win that job…will be watching that spot closely. A big surprise? Pleasantly, no true frosh on the DC. I expected to see at least one name in the secondary, but not so. So, there you have it…my take on the season’s first DC. Man I am so eager for this season. Love to hear your thoughts on the DC or the game in general. Miss you bro…will f/u on trip up to see you guys soon. I agree with you on the Rick Smith hire and cannot wait to see the impact. Would love to see Overton mature and in the line up regularly..,a great talent! Cheers UV…thanks for dropping in. You know, I think Rick Smith may be the most important hire we’ve made in the past 4 years. I see Johnny White having more length than Stanley and maybe able to get in Heincke’s vision better. I expect to see Stanley a lot. He was a little banged up during camp I thought too. Overton needs to mature. He did that stupid bonehead ball drop at USM last year and then the dog issue with his ex girlfriend. Both showed poor judgement, IMO. He’s definitely a talent though. Really hope to see a strong Rick Smith defense tonight and throughout the season. Predictions on ODU? Ron sorry I have been out of touch but like you spend most of my days on the road. This post of course comes after the game and I didnt see much of a change from last season. Our passing game was good but we never seem to strech the defense which would help to open up the run. My fear in playing against a bigger and better opponet we will be shut down as you will have bigger faster players in smaller areas thus jamming up both the passing and running lanes. On the other side of the ball we look bigger stronger and yet we cant generate anything that looks like a pass rush and it seems we struggle to bring anyone down after contact. I hope the penality bug does not return either. Overall we played about the way one would think for an opener. My fear is its almost as if we have to play a near perfect game on offense if we expect to win based upon the way our opponets march down the field against the Defense. Hey, DCP28…good to hear from you friend. I share some of your concerns. Working on a post-game post now so your timing is great. Have maybe some different bents, but I think that what we learned yesterday IMO is that we cannot take a single game for granted and that we have a ways to go all around. Glad to have the win though!